John Cromer Braun, the last of the Cairo Poets, died yesterday at the age of ninety-seven. 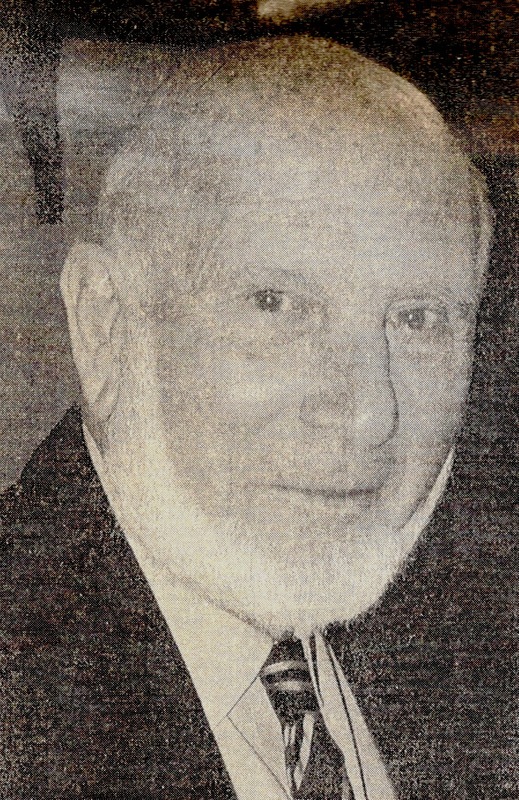 As a lawyer he was known as John Braun; as a poet he was John Cromer, and it was in this guise, while serving with British Security Intelligence in Egypt during the Second World War that he co-founded the Salamander group which collected and published poems by men serving in the armed forces, publishing them in their Salamander literary magazine and their series of Oasis anthologies. Here is one of John's poems published by the Salamander group at the time. It is called Asleep in War. Gold in your hair the moonlight gleamed. Though I knew not what were the dreams you dreamed. Pale was your face, no smile was there. The splendid lustre had left your hair. A trickle of blood lay by your head. Raiders had passed - but you were dead. In Cairo John became lifelong friends with Mursi Saad el Din with whom he later wrote Under Egypt's Spell: The Influence of Egypt on Writers in English from the 18th Century. Mursi died last year; in this article in Egypt's Al Ahram newspaper he tells about the Cairo Poets. As Mursi explains, Salamander was one of two groups of poets in Cairo at the time, the other formed mostly of civilians and known for their literary journal Personal Landscape, its founders Lawrence Durrell, Robin Fedden and Bernard Spencer. 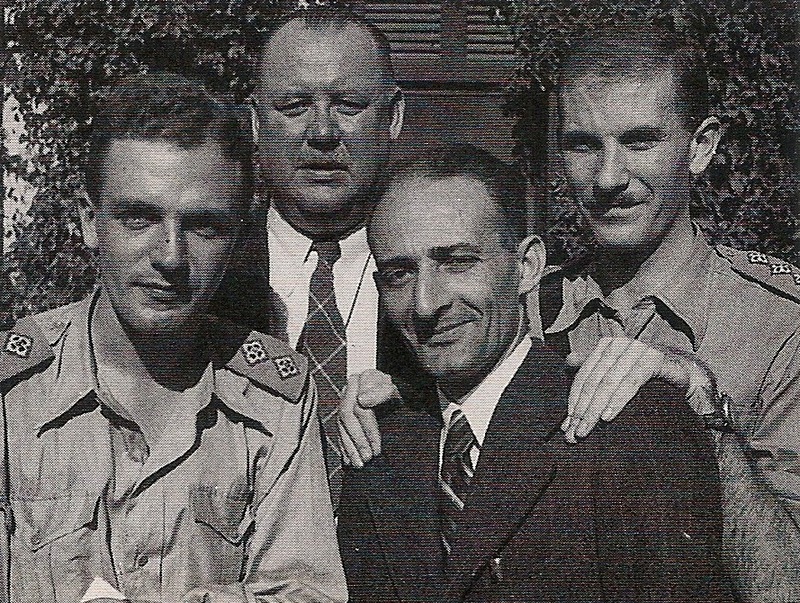 When Durrell arrived in Egypt, having just escaped from Greece in 1941 with the Germans on his heels, it was John Cromer Braun in his role as Field Security officer who gave him clearance. I interviewed John about that event for my book Alexandria: City of Memory, from which I reproduce this passage. In the darkness before dawn on 1 May 1941 an Australian transport making the perilous crossing from Crete arrived at the boom of the Western Harbour, the ancient Eunostos of 'safe return'. The boatload of refugees had been expected for some time, and John Cromer Braun along with two other field security sergeants assigned to meet it had spent several days in idleness, eating ice cream and drinking coffee at Pastroudis on the Rue Fuad and regaling themselves on beccafico, the little birds that are a Levantine speciality, washing them down with quantities of Mareotic wine. Now suddenly at four in the morning they were awakened in their barracks at Mustafa Pasha and told to bustle down to the docks where the near moonless night screamed with a barrage of tracer fire. This did not seem the best moment for Durrell's notoriety to proceed him: until the outbreak of war he had been living on Corfu, where in 1937 on his twenty-fifth birthday he completed The Black Book, his savage portrayal of a swaddled spiritual and sexual culture that he called the 'English death'. T S Eliot, a director of Faber and Faber, greeted the novel as 'the first piece of work by a new English writer to give me any hope for the future of prose fiction' but for fear of an obscenity prosecution would not publish it without cuts. Durrell refused, and instead an unexpurgated edition was published in Paris with the help of Henry Miller, whose own Tropic of Cancer, banned in Britain and America, was enjoying a succès de scandale. 'No, not at all', replied Braun, whose poetry had been published in London before the war and who was also a keen admirer of Miller, 'I would just like to talk to you about it.' After passing through Egyptian immigration, Durrell, Nancy and their ten-month-old daughter Penelope were placed in separate transit camps for men and women, Durrell at Agami, west of the city, where Braun went to join him that evening. 'We spent the whole night in a slit trench watching the air barrage while we talked about Paris and Henry Miller and literature till the next day when they were reunited - my recollection is that they were put on a lorry, the three of them, and sent to the Luna Park Hotel in Cairo'. I had the benefit of talking with John many times, not only for my Alexandria book but also gathering information for the biography I am writing about Lawrence Durrell. The London International Surrealist Exhibition of 1936 features in the early correspondence between Durrell, then in Corfu, and Henry Miller in Paris. I wondered if John knew anything about it. To my astonishment he produced the programme; he had made a special trip from Portsmouth up to London and gave me a first hand recollected tour. The founders of the Salamander group, L to R: John Waller, Keith Bullen, Raoul Parme and John Cromer. Copies of Three Caravan Cities are very scarce. 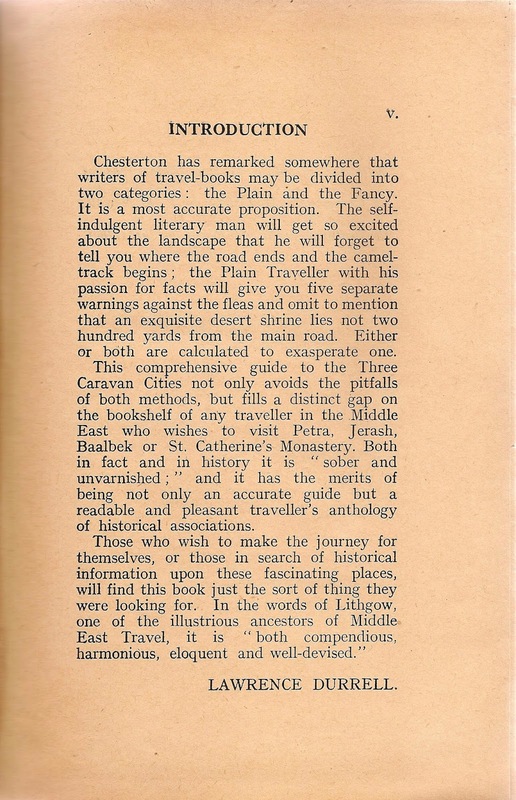 Three Caravan Cities was published in Alexandria in 1945 by Whitehead Morris, the same firm that published the first (1922) and second (1938) editions of E M Forster's Alexandria: A History and a Guide. 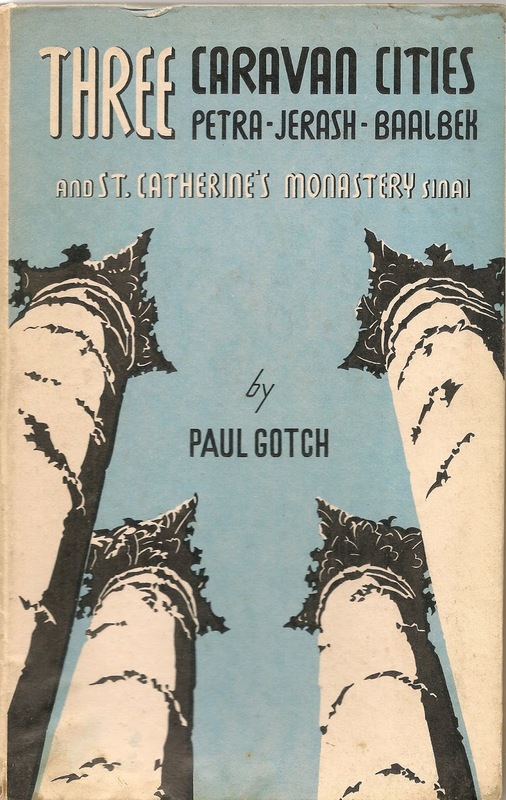 Its author was Paul Gotch who worked for the British Council in the city, at the opposite end of the same building where Lawrence Durrell was working at the British Information Office. Gotch and Durrell also lived in the same house, the Villa Ambron, in Moharrem Bey. They were close friends, and there was probably no one who had a closer round-the-clock eye on Durrell during those wartime days in Alexandria than Paul Gotch. That explains how Durrell came to write the introduction to Three Caravan Cities. Not that Durrell's name is on the cover or the title page, and I suspect that his contribution was overlooked by the second hand bookshop where I picked up my copy, because I got it for very much less than this rather rare book might be expected to sell for. 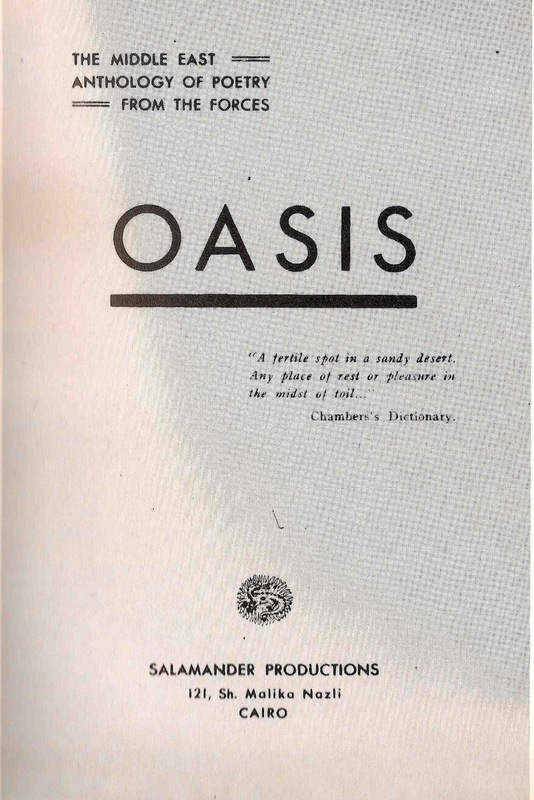 Published by Whitehead Morris in Alexandria 1945; no mention of an introduction by Lawrence Durrell. 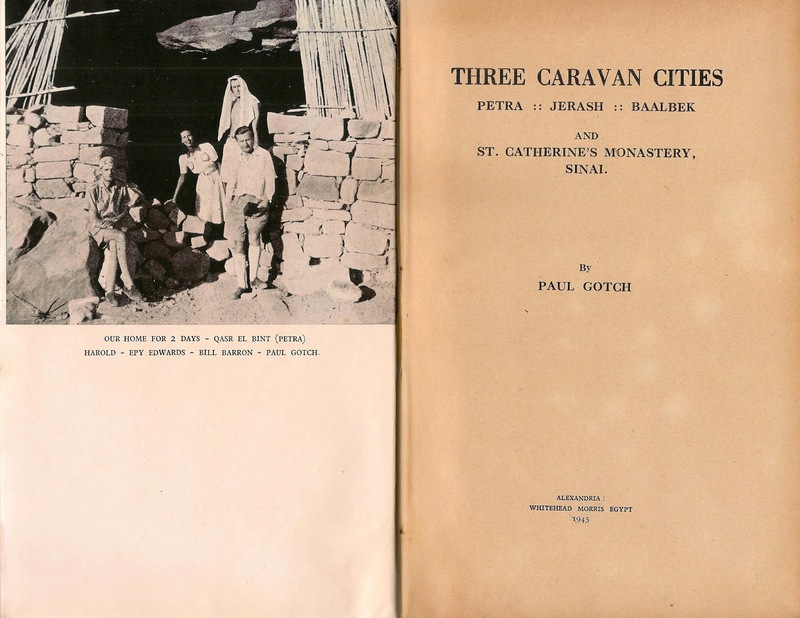 Three Caravan Cities describes Paul's visits with his wife and friends to Baalbek in Lebanon and Jerash in Jordan in July 1941, to St Catherine's Monastery in Sinai in April 1943, and to Petra in Jordan via Jerusalem in August and September 1944. It was just after that journey to St Catherine's that Paul and Billy moved in with Durrell and his girlfriend Eve Cohen, first at an enormous dark and gloomy flat on the Rue Fuad, then moving all together to the Villa Ambron in October. In the summer of 1944 when Paul and Billy went travelling for six weeks across Sinai to Palestine and Jordan, the occasion of their visit to Petra, they left their two infant daughters for the whole of that time in the care of a nanny under the supervision of Durrell and his future wife Eve Cohen who in many respects would be the model for Justine in The Alexandria Quartet. It was all very domestic, cooking meals, changing nappies, writing books, that sort of thing. Paul Gotch and friends living among the ruins at Petra. Two of Paul's friends on the journey to Petra were Harold Edwards, a teacher at the British Council in Alexandria, and his Greek wife Epy. They had escaped the German invasion of Greece by the skin of their teeth, much as Durrell had done in April 1941 when he put to sea at Pylos in the Peloponnese in an overloaded caique with his wife Nancy and his year-old daughter Penelope. 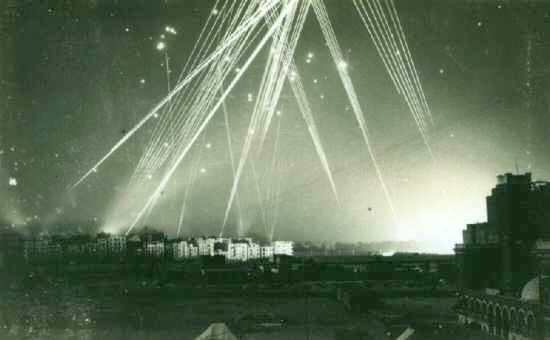 Evading dive-bombing Stukas, they managed to reach Crete, from where they went to safety in Egypt. Now Harold and Epy also lived at the Villa Ambron. So Paul's book, though it is about caravan cities, offers something of a glimpse into Lawrence Durrell's world in Alexandria during the war - often in ways that do not meet the eye unless you know where to look. 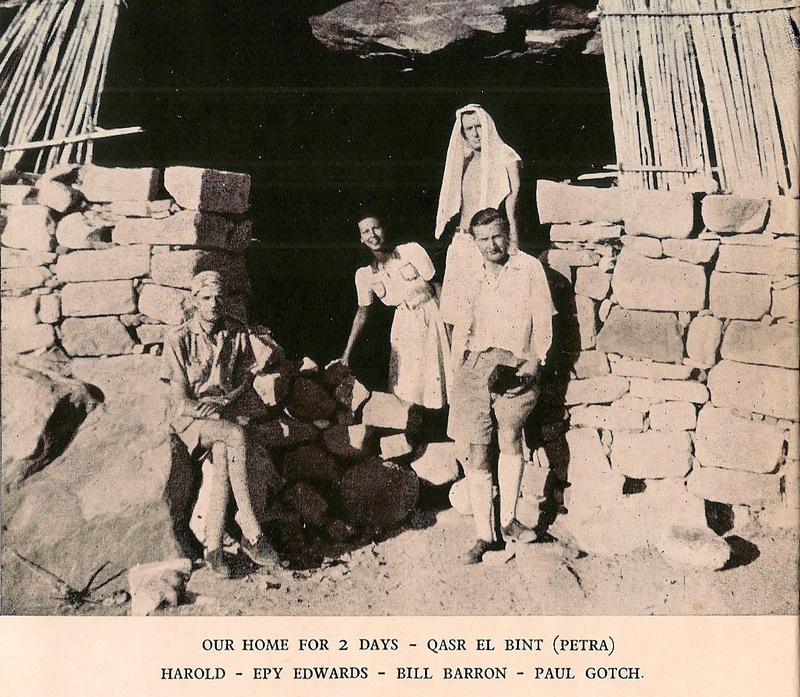 For example, that photograph, above, of Paul and Harold and Epy living amongst the ruins at Petra. They had driven first from Alexandria and across Sinai in a Standard Eight, then at Jerusalem's Damascus gate they took 'a tougher means of transport', a taxi in fact, for the final leg to Petra. In Jerusalem Paul and Billy slept in the open on the terrace at Nancy Durrell's house, that is Durrell's wife Nancy who had been evacuated to Palestine at the time of the Flap in July 1942, where she got to know Billy who had been evacuated there too. Later that year Nancy wrote Durrell to say she was not coming back; the worst of it for Durrell was losing his daughter whom he would not see again until long after the war when she was seven. But though Durrell was estranged from his wife and could not see Penelope, Paul and Billy could, and from Petra and Jerusalem they returned to Alexandria with photographs for Durrell of his child and reports of her; it was a bitter-sweet experience for Durrell, Paul's return from his caravan journey to the Villa Ambron - the theme of missing daughters runs through The Alexandria Quartet. That might explain the brevity, the terseness, in Durrell's introduction to Gotch's Three Caravan Cities. For Durrell the book was about a journey he could not make, a journey to Jerusalem, the recovery of a lost daughter, the reclamation of a broken life. Seeking clues in Durrell's introduction. At the end of his introduction Durrell gives a clue to where his feelings lie when he mentions William Lithgow, 'one of the illustrious ancestors of Middle East Travel'. Lithgow was the author of Rare Adventures and Painful Peregrinations, an account of his Eastern travels published in 1632. Lithgow had come to Alexandria, this once 'most renowned city', in 1612 and found it 'greatly decayed' and 'mightily impoverished', with an 'infectious air' producing 'bloody fluxes and other heavy sicknesses'. Which is not far off how Durrell felt about his situation. But three years earlier, in 1609, Lithgow had been in Corfu, like Durrell himself. 'Corfu is an island no less beautiful than invincible: it lieth in the Sea Ionean, the inhabitants are Greeks, and the Governors Venetians; this Ile was much honoured by Homer for the pleasant gardens of Alcino which were in his time' - these were Lithgow's lines, capturing something of the island's charm, that Durrell quoted in Prospero's Cell, his book about the idyllic years he had spent in Corfu with Nancy.